In the midst of the lavender-clad Provençal landscape, where one might expect rustic manors of time-worn stone, you’ll find a more modern gem – a rather out-of-the-ordinary one that’s breathtaking in the best way possible. That gem is Villa La Coste, an intimate 28-villa-suite property that sits high on the hillside of Château La Coste – an exclusive private vineyard well renowned for mastering a perfect combination of wine, art and gastronomy. Just twenty-five minutes from Aix-en-Provence, Villa La Coste is an extraordinary luxury hotel & spa that’s set on a rolling estate of more than 500-acres of vineyards, gardens, and an art collection that rivals a national gallery. The vibe is laidback, so much so that it feels as if you’re truly staying in someone’s private home. From the gorgeous accommodations and the awe-inspiring art exhibitions, to some of the best dining in the world, the spectacular spa, and to the impeccable service – it’s one of the most special places we’ve experienced to date. Each of the 28 Villa Suites offer a private terrace with panoramic views that overlook the Luberon and the domain Château La Coste. They are all spacious, filled with natural light and are contemporary in design. Of the 28, there is a limited number of 2-Bedroom Villa Suites. Though Villa La Coste can only welcome few to stay at once, the property offers out-of-this-world dining options led by the legendary three Michelin-star chef Gérald Passedat. Whether you desire the utmost fine dining experience or prefer a more casual meal at any time of day in the garden, the library, the living room, the gallery or even in the piano bar – the food is some of the best in the world! At the domain’s restaurant, you’ll find to-die-for cuisine led by Argentinian celebrity chef Francis Mallmann. There’s a serene Japanese-style spa featuring a hot-spring onsen bath, a hammam, seven treatment rooms and a space for yoga & pilates lessons. Surrounded by olive trees, there’s a beautiful heated outdoor pool with huge beds to soak up the sun in between dips in the pool and sips of Chateau La Coste rosé (highly recommended). Art can be found at almost every turn: be it one of thirty major installations scattered throughout from architects and artists like, Frank O. Gehry and Renzo Piano, rotating exhibitions in the Tadao Ando Art Center, or even a Tracy Emin or Andy Warhol hanging in your very own villa. 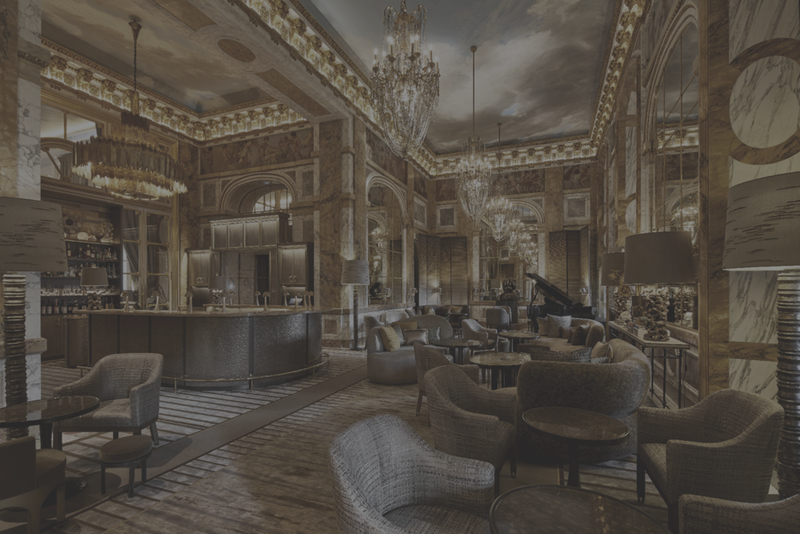 Following a four-year renovation, the historic Hôtel de Crillon, A Rosewood Hotel has been reimagined with a delicate balance between conservation and transformation. The property perfectly illustrates the philosophy behind Rosewood Hotels & Resorts: the hotel is an 18th century architectural treasure that has witnessed and played a role in major moments in French and world history. Today, this past becomes a rich backdrop to Hôtel de Crillon’s modern-day story. And the meticulous attention to detail does not go unmissed: from the preservation of even the smallest details like the original knobs on the doors to the modern in-room amenities like the bespoke toiletries by Buly 1803 or even the shower caps that mimick that of Marie Antoinette’s. Ideally located in the heart of Paris, the timeless Parisian landmark is within walking distance from some of the city’s best shopping and most iconic sites. The 78 rooms, 36 suites and 10 signature suites vary widely in style and design, even those in the same category. Whether you prefer a more traditional Parisian-style or a more refined contemporary look, a more spacious living space or a larger closet, a view overlooking the stately inner gardens or a terrace that looks out to the Eiffel Tour – Hôtel de Crillion offers it all. We personally love the light and airy Grand Premier Rooms that have a terrace overlooking Rue Boissy d'Anglas, as they capture the essence of a modern Parisian residence. The hotel’s 10 signature suites are uniquely inspired by their 18th-century heritage, with some salons paying homage to Marie-Antoinette, Louis XV, and composer Léonard Bernstein. Karl Lagerfeld has brought his personal vision of French chic and modernity to two suites, the Grands Appartements. Forgoing the typical French Michelin-starred restaurant, Brasserie d’Aumon has a distinctively Parisian bistro vibe and is open all day. 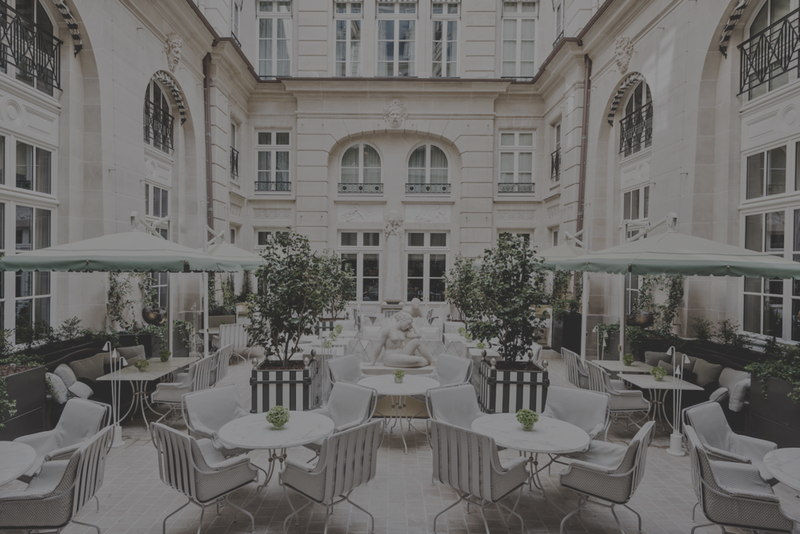 The hotel’s hidden gem and one of Paris’ best-kept secrets to this day, L’Ecrin is a fine-dining experience featuring inventive and creative dishes by by young Chef Christopher Hache and welcoming only 28 guests each evening. The lively 60-seat bar Les Ambassadeurs is the scene to be seen and has an impeccable selection of the three “C’s” – cocktails, champagne, and caviar. Serenity can be found at the hotel’s spa – the perfect place to unwind after a busy day of exploring the City of Lights. The masterpiece might just be the jewel-box pool that's illuminated by a natural well of light and lined with 17,600 gold scales. And the spa, of course, has an extensive menu of bespoke French beauty treatments. Men are not forgotten, as the hotel has an exceptional space devoted to men’s grooming. For those looking to work up a sweat, there’s a contemporary, cutting-edge fitness studio.